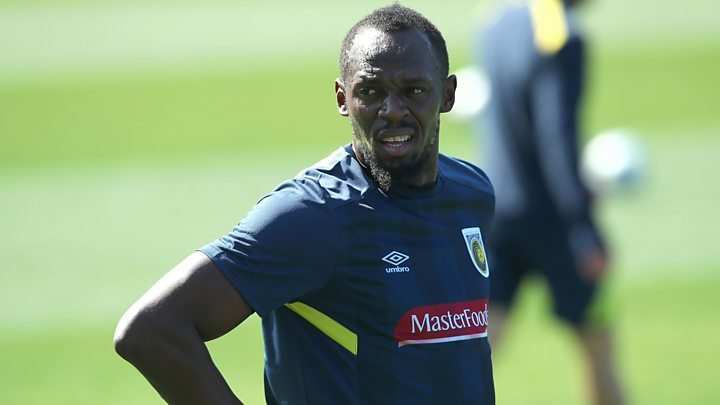 Usain Bolt vowed to "prove people wrong" as the champion sprinter trained for the first time with Australian football club Central Coast Mariners. As the eight-time Olympic champion trades his running shoes for football boots, we spoke to other people who have drastically changed jobs. Betsy Finocchi, a 56-year-old lawyer and grandmother from Arkansas, US, might not immediately seem to have much in common with the sprinter. But Ms Finocchi also knows what it is like to change careers. In 2010 aged 47, she passed the bar and now runs a legal practice in Fayetteville, with her mother, Gail Segers. Her mother was an even later starter. Still practising at 82, she didn't pass the bar until she was 61. "My mother used to run a sporting goods store but she always wanted to be a lawyer. When the shop started going out of business she decided to go for it. At the age of 61 she passed the bar," the lawyer told the BBC. "I started working for her as a legal assistant after a number of side jobs. Then as she approached retirement age I thought I would go to law school and get qualified myself. "Going to law school later in life was an interesting experience. I generally got on with my class mates but many didn't realise I was in my forties. "I hear people say they can't change jobs later in life but I say don't do that to yourself." Ms Finocchi has some some advice for anyone wanting to switch careers. "It's never too late, but remember it has to be something you want to do." Brooke Hender, 51, from London, UK, has just completed his first year as a full-time cognitive hypnotherapist. "I was an actor - one of the many struggling to get by," he told the BBC. "For a day job I was working at the British Film Institute as an executive assistant." Mr Hender spent years in the film industry before the death of a close friend prompted him to re-evaluate his options. "I had no interest in therapy. But a friend suggested I get some to deal with some stuff. "It was the therapist who actually told me they thought I'd make a good therapist." At first, he laughed off the suggestion. But just a few years later he had the opportunity to study cognitive hypnotherapy. "I became interested in how I could make a difference to others," he said. "I made the brave/foolish decision to go from full-time employment to full-time self-employment. "I don't think you really appreciate what's involved until you just do it. "But I don't regret it at all - not only developing the business and my own skills as a therapist but having the pleasure and privilege to help others." Stephen Millett, 47 in Tucson, Arizona, US, lost his teaching job during the 2009 financial crash. "When I lost my job I had a two month-old son and found myself with little job prospects in Tucson, Arizona." He was unemployed for a year before he enlisted in the US Army at the age of 38, and was deployed to Afghanistan in 2012. "At the age of 41, I was doing mounted and foot patrols in Afghanistan. "And, after my three-year enlistment I was honourably discharged."